Tickets: $18 online before the event or $20 at the gate. Get tickets here. An exciting evening of dance works by emerging artists and special guests from London and beyond. This performance will take place on the beautiful lawns of Eldon House, and is our way of nurturing young choreographers in our city. Bring your own picnic blanket or lawn chair. 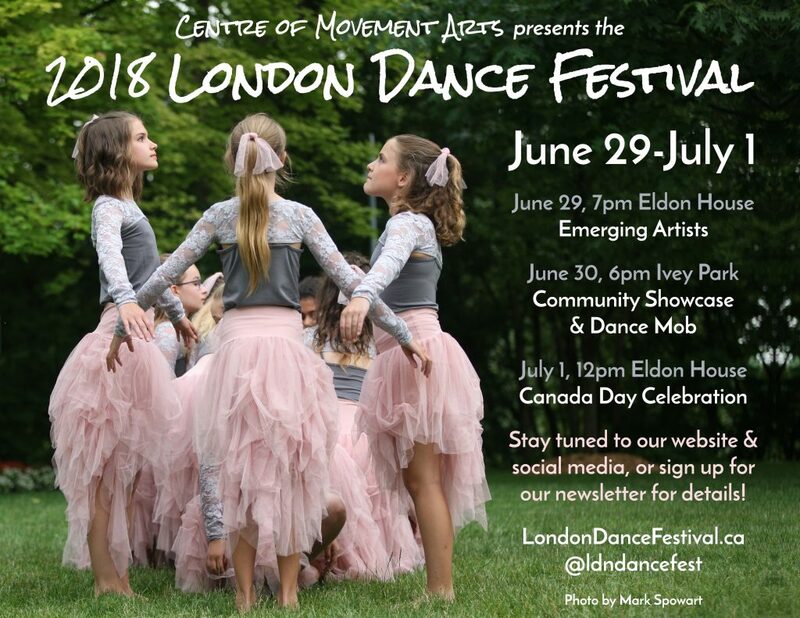 Enjoy an outdoor performance by a selection of local artists of all ages, plus special guests and our annual Dance Mob. The Dance Mob is a fun and easy dance created by local artists and performed by the community. No dance experience is required and all ages and abilities are welcome. You can learn the moves from the instructional video, or at one of our workshops. Then come down to our Community Showcase in Ivey Park on June 30 at 6pm and dance with us! More details coming soon.